VideoGamer.com - "I would love to see more dark human stories explored like this." Giant Bomb - "The production quality is 10 times the quality of most FMV games"
BBC Click - "So far, the experience is an intriguing mix of movie and mystery game"
Gamesradar - "So if you're looking for something new to binge on and don't mind getting a little weird, forget Netflix. Set aside a couple hours, grab The Bunker, pop some corn, turn out the lights, and hang on tight to your controllers.". Remember all those old-school, hammy FMV games of old? The Bunker is the complete opposite of that. Sporting live-action performances from a star-studded cast, you take the role of John, trapped in a nuclear bunker in which he has lived for his entire life. 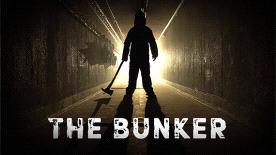 With all sorts of eerie goings on and open-ended choices to choose from in the game, The Bunker looks to be a dalliance between old-school Live-action games and more modern adventure games like Life is Strange. There’s so much to see in The Bunker, which is clearly dripping with atmosphere in every single shot we’ve seen. The sharp, claustrophobic atmosphere is the perfect setting for this live-action Thriller.